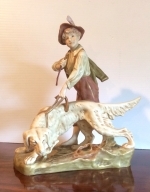 FABULOUS LARGE ANTIQUE ROYAL DUX HAND PAINTED PORCELAIN FIGURE OF A BOY HERDING CATTLE. WONDERFUL PAINT WORK WITH LITTLE OR NO SIGNS OF AGEING OR HANDLING .A FINE EXAMPLE IN SUPERB CONDITION ! ! 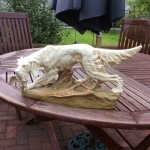 Superb Royal Dux study of an English Setter retriever with game. 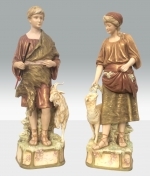 Lovely pair of Royal Dux figurines,shepherd and shepherdess. 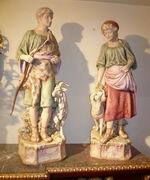 Fabulous Large Pair Of Antique Royal Dux Figures Of Shepherd and Shepherdess. 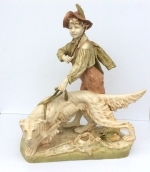 Very Large Antique Royal Dux Figurine Of Boy And Dog. 18ins x 16ins wide x 6ins deep. 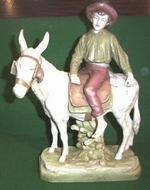 Superb Antique Royal Dux Figurine of Boy On Donkey. 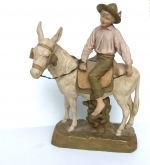 Beautiful Antique Royal Dux Figurine of Boy On Donkey. 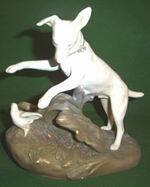 Superb pair of Antique Royal Dux Hunting Dogs. Very Rare Large Antique Royal Dux Group Of Farmer And Wife Mending Plough With Bull. 20ins x 9ins x 8ins. 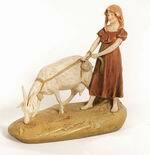 A Royal Dux group of girl with goat.